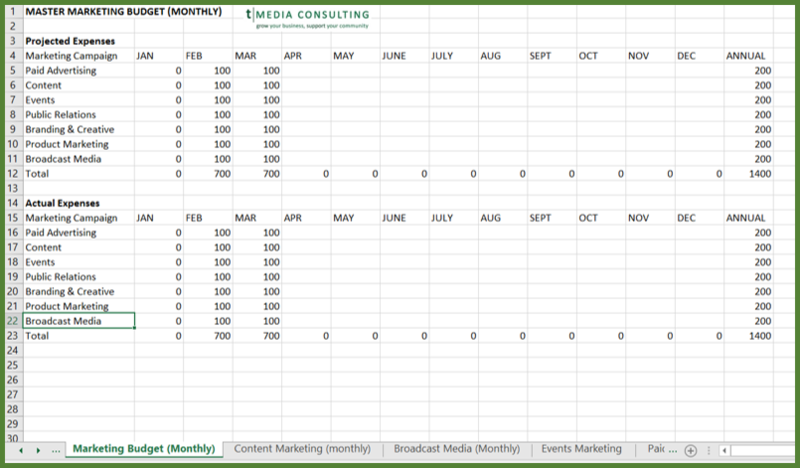 With this template you will be able to plan your content budget and compare that projected budget to actual spending. Fill in your projected expenses for the corresponding time periods and categories (e.g. Software, Publishing Tools, etc.) and totals will be calculated automatically. You can then update the actual expenses table to see how well you're sticking to your budget. Budget - Monthly is for budget planning on a month-by-month basis, while Budget - Quarterly is for budget planning on a quarterly basis. Use the Master marketing budget template to keep track of everything at a glance. Templates Included: Master Marketing Template, Broadcast Media Marketing, Content Marketing, Events Marketing, and Paid Search.